Ecoyards offers full service design, installation and maintenance of water-efficient sprinkler and drip irrigation systems. Irrigation is one of the most important things you can do to protect the investment that you have in your landscape, lawn and planting beds. We want to keep your landscape looking its best, while helping you conserve water. Contact us by email today to setup a free consultation. Our certified irrigation professionals will evaluate your property and review your preferences to create an efficient irrigation plan for your property. Weather sensor for smart irrigation controller installed by Ecoyards in Seattle. The city of Seattle offers many rebates to homeowners inside and outside of the house through the Saving Water Partnership, including rebates for rain sensors, smart controllers, drip irrigation, sprinkler heads and more. 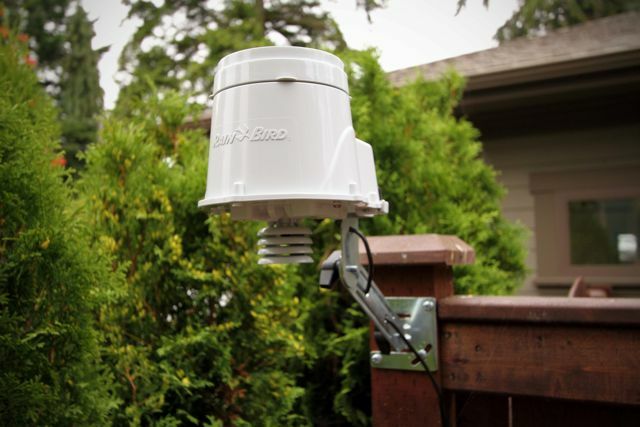 Click here to read about an irrigation project we completed in North Seattle using the latest in smart irrigation technology, which qualified the homeowner for a nice rebate from Seattle Public Utilities. Drip systems and micro-irrigation apply water slowly and directly to a plant’s root zone. Properly installed drip systems reduce soil erosion, water use, fertilizer and pesticide runoff and water loss due to evaporation, and decreases diseases such as powdery mildew. Our custom irrigation systems commonly include tradition sprinkler heads for lawn areas and drip irrigation systems for watering plant beds, containers, and vegetable gardens. For more information and tips on efficient irrigation techniques, be sure to read through our blog post category related to irrigation services.